1) Tom Fiddaman on a new Nature paper (doi:10.1038/nature08932) from Eugene Stanley‘s lab on cascading failure in connected networks, that shows that feedbacks between connected networks can destabilize two stable networks. … we show that pre-Columbian farmers of the Guianas coast constructed large raised-field complexes, growing on them crops including maize, manioc, and squash. Farmers created physical and biogeochemical heterogeneity in flat, marshy environments by constructing raised fields. When these fields were later abandoned, the mosaic of well-drained islands in the flooded matrix set in motion self-organizing processes driven by ecosystem engineers (ants, termites, earthworms, and woody plants) that occur preferentially on abandoned raised fields. Today, feedbacks generated by these ecosystem engineers maintain the human-initiated concentration of resources in these structures. Engineer organisms transport materials to abandoned raised fields and modify the structure and composition of their soils, reducing erodibility. 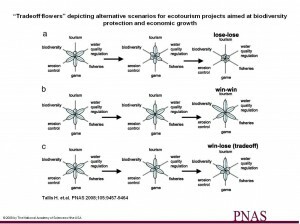 The profound alteration of ecosystem functioning in these landscapes coconstructed by humans and nature has important implications for understanding Amazonian history and biodiversity. Furthermore, these landscapes show how sustainability of food-production systems can be enhanced by engineering into them fallows that maintain ecosystem services and biodiversity. Like anthropogenic dark earths in forested Amazonia, these self-organizing ecosystems illustrate the ecological complexity of the legacy of pre-Columbian land use. 3) The World Bank has launched a new web site: data.worldbank.org to provide free access to development data. Their data catalog provides access to over 2,000 indicators from World Bank data. it was vital for the bank and its partners to intensify their focus on measurable environmental protection, given rising vulnerability to environmental risks and the increasing flow of financing for projects related to climate change. 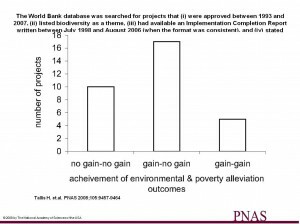 … Cheryl Gray, the director of the review group for the World Bank, said the lack of consistent internal tracking of the environmental facets of projects was an indicator of how much work needs to be done. The World Bank Group approved its first set of common environmental standards in 2001, for the first time making environmental stewardship part of its core mission of reducing poverty. But the new evaluation found a persistent lack of environmental focus in each step along the lending chain — from the priorities that shape development projects to the environmental standards and monitoring required in the field. Things appear to be improving, though, Mr. Thomas said, partly because analysts for the bank and its lending partners are running the numbers on the economic benefits of resilience. “The rate of return on prevention can be 4 to 12 times the investment,” he said. Often, he noted, there is no inconsistency between environmental conservation and resilience to disasters. He cited the example of maintaining coastal mangrove forests as a buffer against flooding. Communities bounded by mangroves persist while those exposed to the waves vanish. There’s no need to crunch numbers to figure that out. A recent Economist article poses the question Does freer farm trade help poor people? Given the ideological slant of the Economist, it is unsurprising that the article concludes yes. The interesting aspect of the article discusses two World Bank research papers that indicate that the way in which agricultural trade is regulated has major consequences. The links between trade, food prices and poverty reduction are more subtle. Different types of reform have diverse effects on prices. When countries cut their tariffs on farm goods, their consumers pay lower prices. In contrast, when farm subsidies are slashed, world food prices rise. The lavishness of farm subsidies means that the net effect of fully freeing trade would be to raise prices, by an average of 5.5% for primary farm products and 1.3% for processed goods, according to the World Bank. These effects are still much smaller than recent food-price spikes, but would they, on balance, help or hurt the poor? In crude terms, food-exporting countries gain in the short term whereas net importers lose. Farmers are better off; those who buy their food fare worse. Although most of the world’s poor live in rural areas, they are not, by and large, net food sellers. A forthcoming study* of nine poor countries by M. Ataman Aksoy and Aylin Isik-Dikmelik, two economists at the World Bank, shows that even in very rural countries, such as Bangladesh and Zambia, only one-fifth of households sell more food than they buy. That suggests the losers may outnumber winners. But things are not so simple. The authors point out that net food buyers tend to be richer than net sellers, so high food prices, on average, transfer income from richer to poorer households. And prices are not the only route through which poverty is affected. Higher farm income boosts demand for rural labour, increasing wages for landless peasants and others who buy rather than grow their food. Several studies show this income effect can outweigh the initial price effect. Finally, the farm sector itself can grow. Decades of underinvestment in agriculture have left many poor countries reliant on imports: over time that can change. The World Bank has often argued that the balance of all these factors is likely to be positive. Although freer farm trade—and higher prices—may raise poverty rates in some countries, it will reduce them in more. One much-cited piece of evidence is a study† by Thomas Hertel, Roman Keeney, Maros Ivanic and Alan Winters. This analysis simulated the effect of getting rid of all subsidies and barriers on global prices and trade volumes. It then mapped these results on to detailed household statistics in 15 countries, which between them covered 1 billion people. Fully free trade in farm goods would reduce poverty in 13 countries while raising it in two. In fact, the bank’s results are not as contradictory as they seem. The two studies are based on different sets of countries: only Peru, Zambia and Vietnam appear in both. And the gloomy analysis measures only the effect of pricier staple foods, whereas the other examines freer trade in all farm goods. Such trade brings broader benefits: even if higher prices for staples exacerbate poverty in some countries, at least in the short term, the effect may be outweighed by increased demand for other farm exports, such as processed goods, as rich countries cut tariffs. These subtleties suggest two conclusions. First, the bank, and others, should beware sweeping generalisations about the impact of food prices on the poor. Second, the nature of trade reform matters. Removing rich-country subsidies on staple goods, the focus of much debate in the Doha round, may be less useful in the fight against poverty than cutting tariffs would be. The food-price crisis has not hurt the case for freer farm trade. But it has shown how important it is to get it right. These papers only assess trade rather than agricultural practices. I would add that the ecological fit of agriculture to the place in which it is practiced will also have substantial impacts on the potential for a regions ability to escape from poverty. Increases in agricultural production that damages other ecosystem services that are important for local people’s livelihood, such a fisheries, fuelwood, flood regulation, or water quality, can do more damage than good. In December 2007 the World Bank unveiled the results of the biggest exercise in window shopping in history. Scouts in 146 countries scoured stalls, supermarkets and mail-order catalogues, recording the price of more than 1,000 items, from 500-gram packets of durum spaghetti to low-heeled ladies’ shoes. This vast enterprise enabled the bank to compare the purchasing power of many countries in 2005. It uncovered some statistical surprises. Prices in China, for example, were much higher than earlier estimates had indicated, which meant the Chinese income in 2005 of 18.4 trillion yuan ($2.2 trillion at then-market exchange rates) could buy less than previously thought. At a stroke, the Chinese economy shrank, in real terms, by 40%. 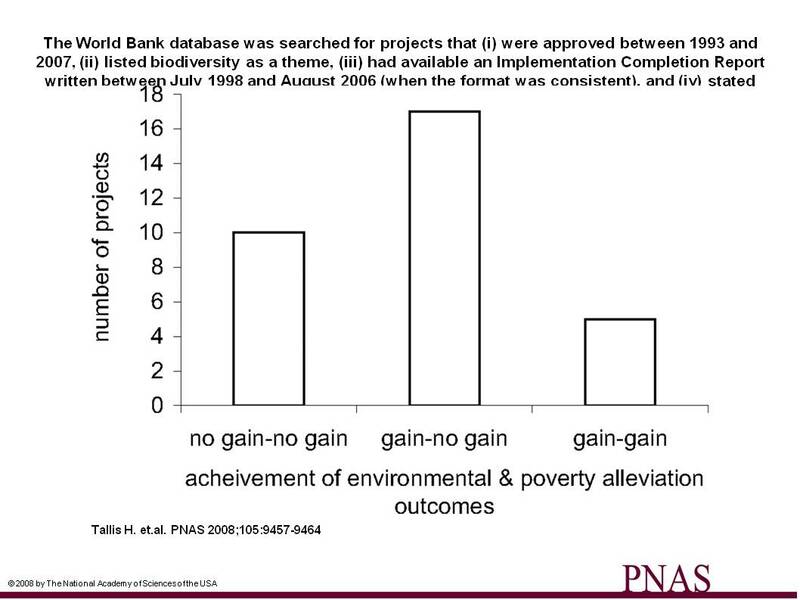 Since then, many scholars have wondered what this economic demotion means for the bank’s global poverty counts. It famously draws the poverty line at “a dollar a day”, or more precisely $1.08 at 1993 purchasing-power parity (PPP). In other words, a person is poor if they consume less than an American spending $1.08 per day in 1993. By this yardstick 969m people suffered from absolute poverty in 2004, a drop of over 270m since 1990. The world owed this progress largely to China, where poverty fell by almost 250m from 1990 to 2004. …[using a new poverty line of $1.25/day (2005 US$) Shaohua Chen and Martin Ravallion ] find that 204m Chinese people were poor in 2005, about 130m more than previously thought. That is the bad news. The brighter news is that China’s progress against poverty is no less impressive than previously advertised. By Mr Ravallion’s and Ms Chen’s new standard, the number of poor in China fell by almost 407m from 1990 to 2004, compared with the previous estimate of almost 250m. This is the 2nd of three posts on well-being and wealth (see 1 & 3). While the increase in average human wellbeing over the past century is good, a common worry of ecologists (and ecological economists) is much of this increase is sustainable. 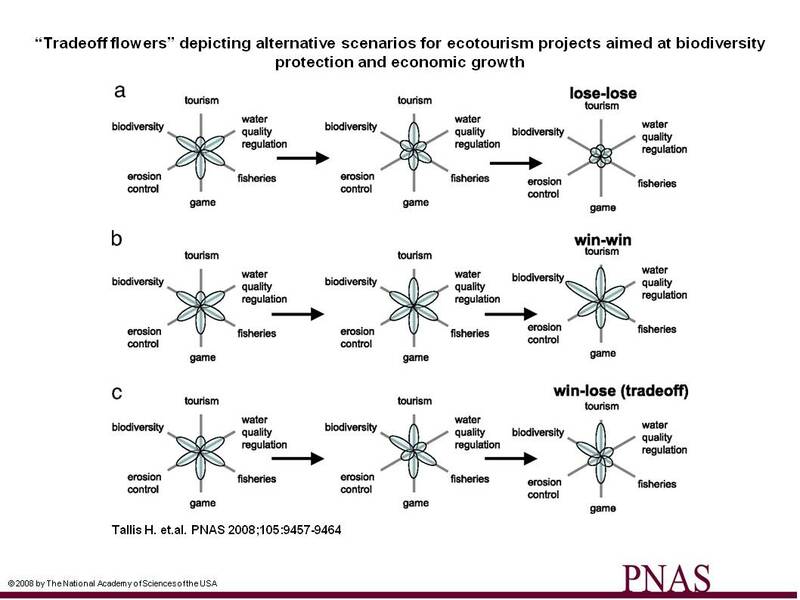 The answer to this question depends upon how much these improvements in well-being come from more efficient use of renewable flows versus how much comes from the liquidation of natural capital.